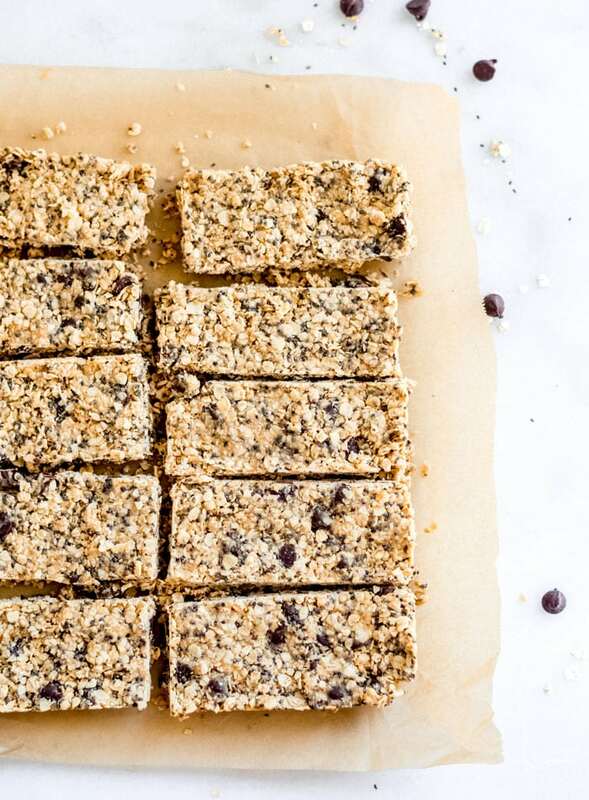 Chocolate Chip Chia Seed Granola Bars | no-bake, no blending, so easy! 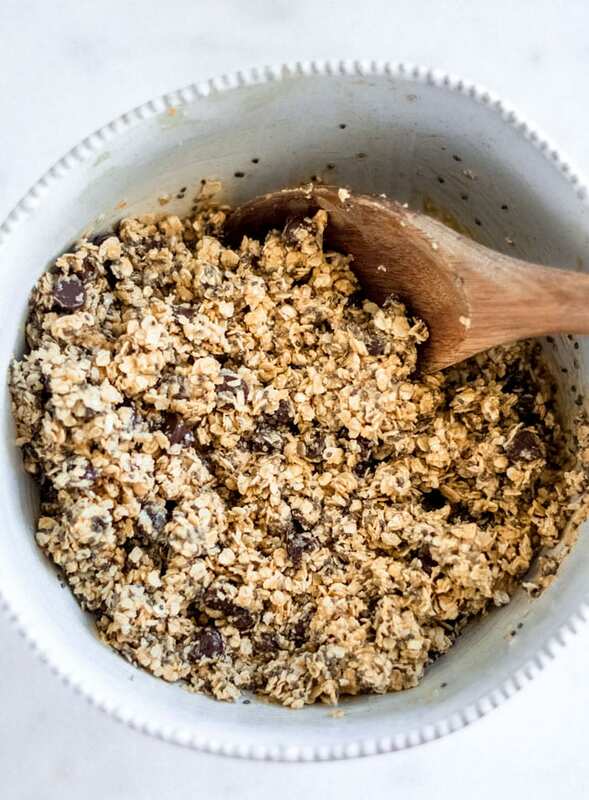 This was my second try making these chocolate chip chia seed granola bars and I’m so glad I re-attempted because I love the addition of chia seeds in this version. They give a nice little crunch and add some extra nutrition. 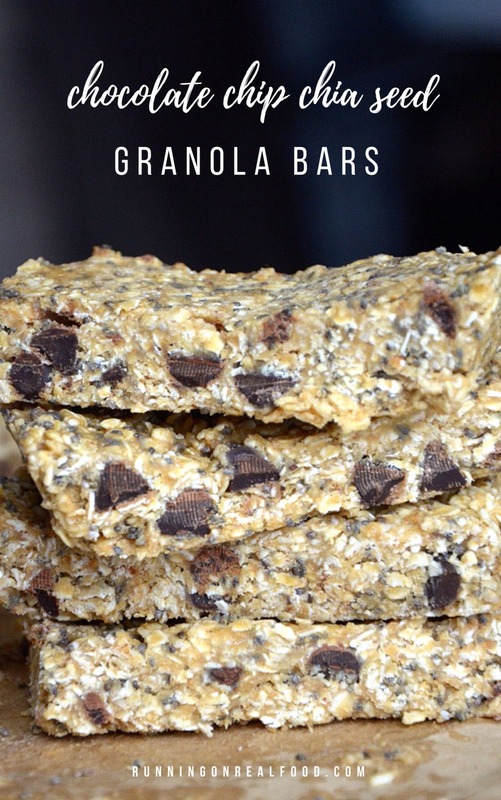 These bars taste amazing and are super easy to make with everyday, basic ingredients. They’re no bake and can be made in one bowl with no blending needed! 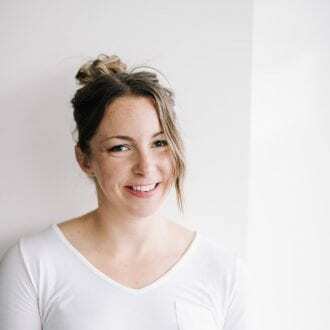 One of the first recipes I posted on Running on Real Food was my No-Bake Chocolate Chia Energy Bars which continue to be a reader favourite. 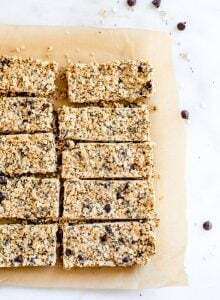 Since then, there’s been Chia Seed Pancakes, Nut and Seed Nutrition Bars and now I get to add these Chocolate Chip Chia Seed Granola Bars to the growing list of chia seed recipes. Chia seeds have a ton of great health benefits. They’re high in antioxidants, fibre, protein and omega-3 fatty acids as well as minerals such as calcium, phosphorus and magnesium. Chia seeds are a particularly good addition to a plant-based diet for their high levels of calcium, omega-3 and protein. 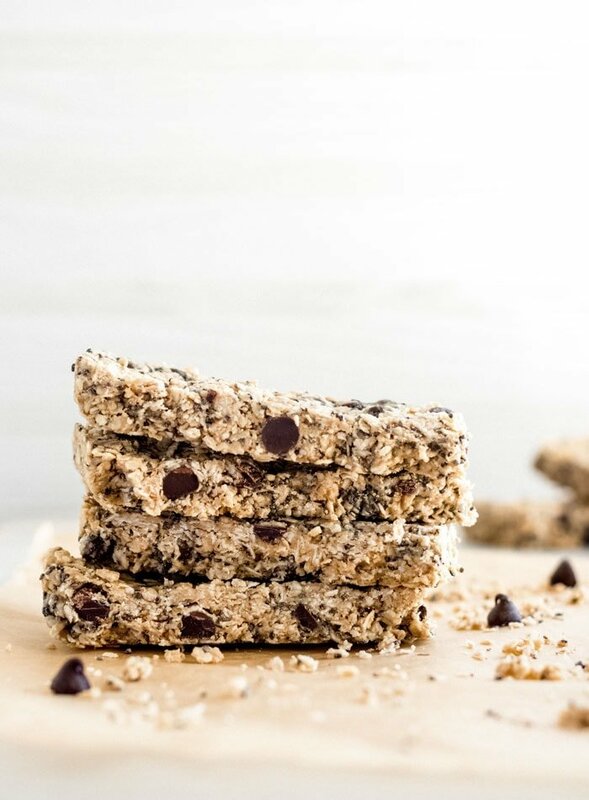 In typical Running on Real Food fashion, these bars are no-bake and only require a few common ingredients to make. Simply mix them up in a bowl, no blending required, press into a baking pan and place in the freezer to set. They taste awesome, are chewy but have a nice crunch from the chia seeds and they make a great breakfast on-the-go or snack anytime of day. You can enjoy these bars for breakfast, as a healthy snack or a sweet treat anytime you need one. They can also be crumbled over a smoothie bowl, dairy-free yogurt or banana ice cream for the ultimate topping! 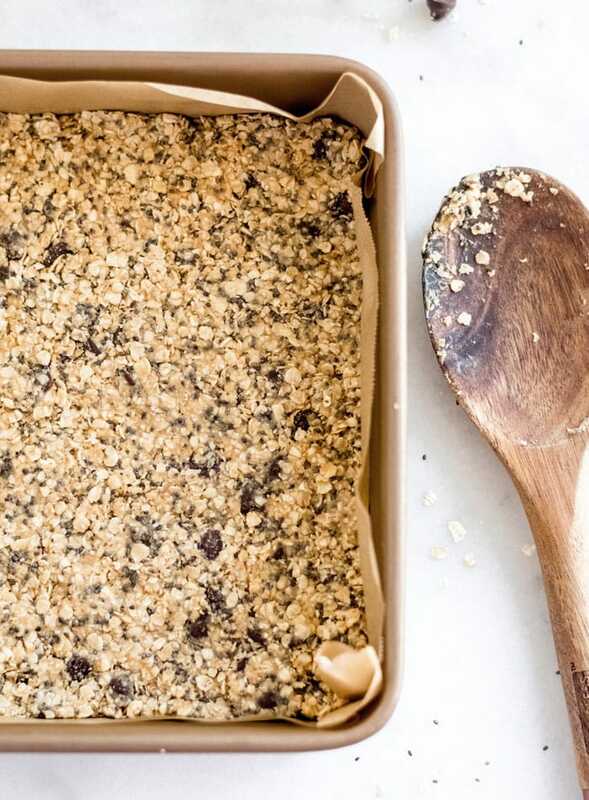 These simple, homemade granola bars feature just a handful of healthy ingredients. No baking required, vegan and gluten-free. Add all the ingredients to a mixing bowl and mix well until thoroughly combined. Line a square baking pan with parchment paper or saran and firmly press the mixture into the pan. Spend a few minutes really pressing it in there, this will help them hold together properly once they’re done. Cut into 8 bars or 16 squares and store in the fridge or freezer in a sealed container. Please note these need to be kept cold to hold together properly. They’re okay at room temperature for a while but as the coconut oil starts to melt they won’t hold together quite as well, it will stay in bar form but be a little crumbly as you eat it. They’re absolutely awesome straight from the fridge, so stick to that for best results! Love adding chai seeds to my smoothies because of all the reasons you listed! This will be great when I don’t feel like drinking my breakfast… and plus chocolate! I want to know if I can use honey, too. That should work fine. Thanks! Hopped over here from Gena’s weekend reading round up, and I ever glad she shined a spotlight on this recipe. I’m currently without an oven, so I’m thrilled to find a healthy sweet treat I can still make! I just need to get coconut oil and I’m in business. I am unable to find GF oats in my town here in Cen.Am. I am wondering if cooked quinoa would be a good sub? Also, any suggestions for veggie add in’s to punch up the nutrition. I love using chia seeds in recipes! These bars sound so simple and delicious. We love how simple the ingredient list is. And no bake?! You can’t beat it! Excited to try these! Thank you for this recipe! Now I don’t have to feel guilty about eating chocolate. 😀 Plus, we don’t have an oven so this is perfect, thank you! And chia seeds, yes please! I made these with coconut butter instead of oil, and they are *fantastic*! Thank you for the recipe. Yum! These are so good and I love how quick and easy they are to make! They are my new go to granola bar. A favourite in my house. Thanks so much for the recipe! Any ideas as to something Gluten Free to sub in for oats? I react to them. These are wonderful. How many calories and/or carbs? I entered everything into my app and this recipe is going to be approximately 364 calories if you make 8 bars, or 182 calories per square if you make 16 squares. This number will of course vary by brand. Thank you for adding that information! Appreciate it. I just made these for my 3 year old and my husband and they are amazing. I like the sweet love, not too sweet. I added pumpkin seeds, ground flax Seeds, and hemp protein. I also made them with coconut peanut butter. They came out a bit crumbly but it was the additional dry stuff I put. In the future, I will add more peanut butter to compensate for the additional ingredients I added. So easy!! Thank you for sharing. That’s so great! I’m so happy you enjoyed them. Oh, that’s awesome! I’m so glad you enjoy them! Could I use old fashioned rolled oats instead of quick oats? I’ve used rolled oats before but found they don’t hold together very well. Oh, okay. Do you know if I could make quick oats from rolled oats by just pulsing them in the processor a couple times? I’ve never done it but I’ve heard that was a thing… I just don’t want to buy separate quick oats for one recipe. Thanks! I am curious about the nutritional/calorie info….. Can you provide that information? I’m sorry, I don’t actually have that. But you should be able to enter the ingredients into My Fitness Pal and get the nutritional info. Thanks! Any other nut butter will work, or sunflower seed butter if you can’t have nuts! Or even tahini! HI! Deryn, good to know about chia seeds granola bars. I always wanted healthy sweet recipes for my kids and here i got it. Keep on sharing stuff on seeds like apricot, pumpkin, hemp etc. because seeds are loaded with fibers. This are fab! Thanks so much for posting!! I made these recently and they were delicious! I did substitute the maple syrup with honey and I thought they turned out great 🙂 excellent recipe, thank you! Sounds delicious! 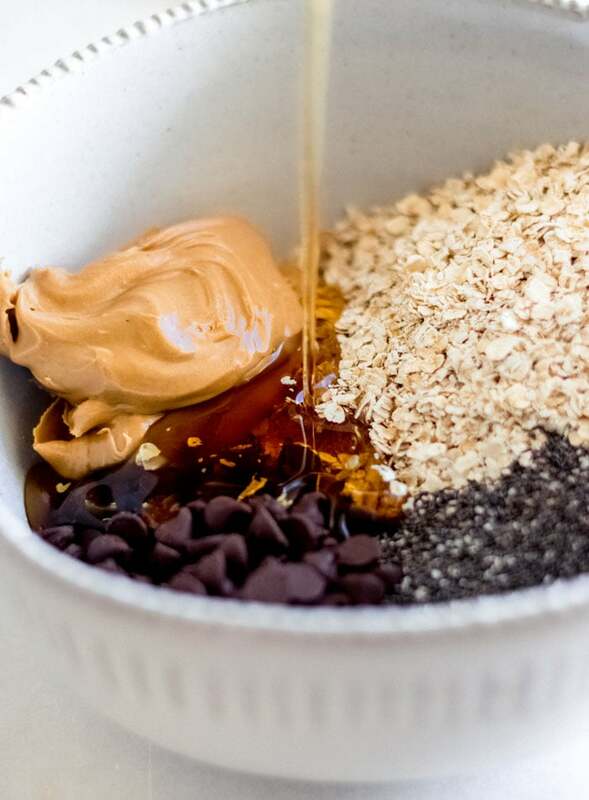 Do you think that I could use steel cut oats instead of the quick oats in the recipe? Thanks! I don’t think steel cut oats would work very well in this one. Tahini or sunflower seed butter. What could be used in place of coconut oil? You can’t really sub the coconut oil in this recipe since it’s needed to hold the bars together. Sorry about that! These are a fan favorite with my husband, 2 year old and 5 year old! I double the recipe to make enough for the week for all of us. I feel good knowing all the ingredients in my kids granola bars and I’m obsessed with chia seeds because they are so good for you! That’s amazing! So glad you guys all like them 🙂 Thanks for letting me know! Is there anything to substitute for peanut butter? Would love to try these, but just don’t like the taste of peanut butter. Do you melt the coconut oil before you mix?